A top Hollywood insider explains the business end of the entertainment industry to help the millions who dream of writing and those who are writing for television, film, interactive, or any area of the industry. Cutting through the mumbo jumbo, Wharton provides crucial information to help writers protect their work, ensure that they get compensated, find an agent, enter into a contract, understand their contract, and avoid getting screwed or sued along the way. 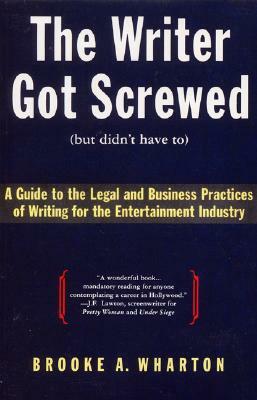 An indispensable roadmap to success, The Writer Got Screwed (but didn't have too) is the first book to untangle the legal and business aspects of writing for the entertainment industry. It is for the young TV production assistant waiting for a big break, the executive with a treatment tucked away in a bottom drawer, the techie targeting the new field of cyberspace writing, or anyone who is inspired to write screenplays. Savvy Hollywood entertainment attorney Brooke Wharton decodes legal jargon, explains how to protect creative work, shows how to read between the lines of a contract, and advises how to avoid getting sued and screwed along the way. Useful resources, including a list of agencies, competitions, fellowships, internships, and legal organizations, make The Writer Got Screwed an essential part of every writer's tool chest. Brooke Wharton is a Hollywood entertainment and copyright lawyer whose clients include some of the industry's top names. She is a member of the faculty of USC's School of Cinema/Television, where she has created a program concerning the business of writing for the entertainment industry. She lectures frequently at California Institute of the Arts, Art Center College of Design, The Directors Guild of America and The National Society of Film Educators.